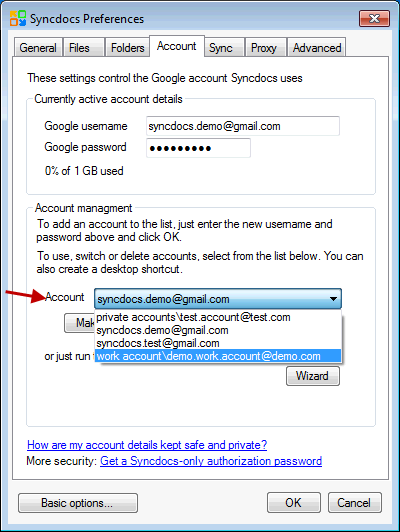 A new feature of Syncdocs, is the ability to sync multiple Google Drive accounts at the same time. Previously you were limited to one account per sync, but Syncdocs now lets you sync many Google Drive accounts simultaneously. Why would I want multiple accounts simultaneously? You might want to keep your work Google Apps for Business and personal Google Drive or Google Docs accounts separate. If you are running a backup server, you might want to sync everyone on your Google Apps domain to the server, but keep their data synced to separate folders. Perhaps you are a web-designer or consultant and work with various different customers at the same time, and need to keep their data in sync. 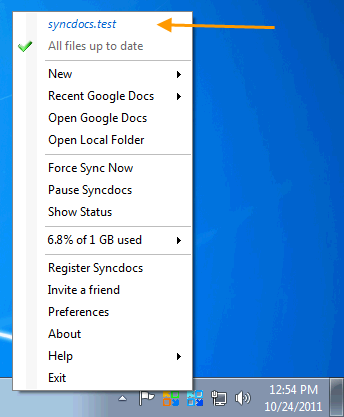 Previously Syncdocs only let you sync one Google Drive or Google Docs account at a time. You could switch accounts, but not use both concurrently. To setup multiple accounts for Google Drive in Syncdocs, do the following. 3. Select the other account you want to use. 4. “Use Now” button runs that other account concurrently when you press the button. 5. “Make shortcut” button makes a shortcut. This shortcut runs the other account. The shortcut is put on your desktop, but you can move it where you want. The shortcut is shown below. It is given the title of your gmail account (“syncdocs.test” in this case) so you can distinguish it. You’ll see a different colored shortcut icon on the taskbar for this other account. You can have as many accounts running concurrently as you wish. Watch out for confusion with multiple accounts running at the same time. The context menu items that are shown when you right click on a file in Windows explorer (like “View in Google Docs” ) are linked to the first (main) instance of Syncdocs that is run. For example if you right click on a file and select “Share in Google Docs”, it will be shared from the first run Syncdocs account. Evaluating your product for my clients. I like the ability to sync multiple accounts to a server. I noticed you can sync 8 pcs to one account, but I didn’t notice a limit to the number of Google Accounts you can sync to one computer? Any help would be appreciated. We haven’t come across any Google limit. You are simply limited by the amount of memory on and resources the local computer. Perhaps 40 simultaneous accounts on a 32 bit system, much more on a 64 bit Windows. I have tried running syncdocs for multiple Google accounts and it works great. 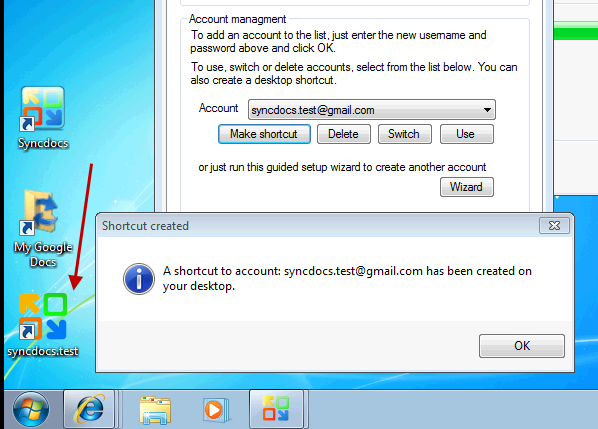 The problem is: when the computer is rebooted only one of the syncdocs account sync’s starts up. The others have to be restarted manually. Is there any way to automate the starting of more than one syncdocs sync service at start up? Yes, you can, but you’ll need to create shortcuts in the start menu yourself for these other accounts. Hi – if I have two google drives – do I need two licences as well for syncing them – because if I switch from one to the other – then on is registred and the othe on trial ?!? Yes, Syncdocs is licenced per account, but you can install it on as many different computers as you want. Simply select a different folder or drive to sync in the “Folders” tab for each user. Syncdocs keeps all settings and files separate between users. Hello, we would like to sync multiple account for our clients in our server, but, we have Google Business Apps with custom domains, that meens we have customer1@mydomain1.com and customer2@mydomain2.com, not gmail.com , can we do this with your application?. The other question would be, do i need one licence for each email domain account? 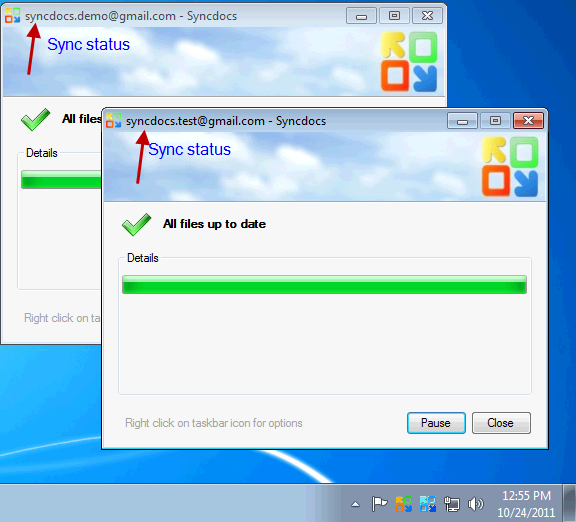 Yes, Syncdocs can sync multiple Google Apps accounts at the same time. Awesome product – Going to try this right now, will update with my findings. I need to support multiple Google Drives for work purposes and I thin this will do the job! 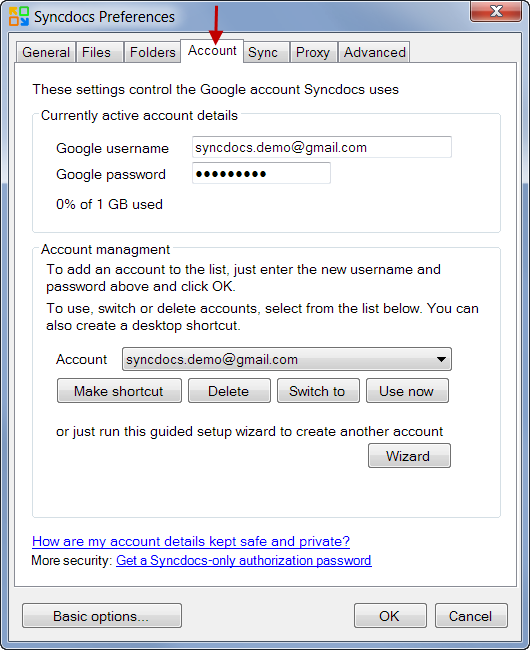 Hi – I have my personal google account synced to my PC using Syncdocs. For a project I am working on I would also like to sync a different Google account. Although you say you can sync multiple accounts I have looked through your on-line help and can’t figure out how to populate the pull-down in Preferences – Account with more than my own personal gmail account. The screen shot in your “How to sync multiple Google drive accounts concurrently” is not even the same as the screen on the version I just downloaded; mine also has an “authenticate Syncdocs on Google…” checkbox and a Re-authenticate button. You start your Help with “Select the other account you want to use..” but this is clearly not the first step as I have only one account in the list to choose from. Please help. You might not be seeing the same setup screen in Preferences because you need to enable the “Advanced Options” in Preferences. Do this by clicking on the “Advanced options…” button on the bottom left of the Preferences screen. Next click on the “Account” Tab and then click the “Make shortcut” button. This will guide you through the process of making an second account.